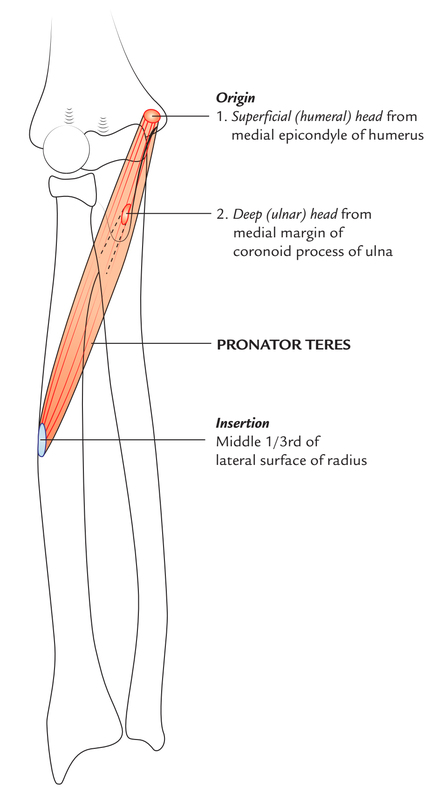 The pronator teres muscle is found on the palmar side of the forearm, below the elbow. It is assisted by the pronator quadratus to perform its major role i.e, to rotate the forearm palm-down. This position is also referred to as pronation. A superficial head which can also be called the humeral head which originates from the medial epicondyle of the humerus. A deep head also known as the ulnar head which originates from the medial margin of the coronoid process of the ulna. Pronator teres muscle inserts approximately into on the middle one-third of the lateral surface (most convex part) of the radius. Pronator teres is supplied by the median nerve. The name of the muscle Pronator teres explains its function as well. The muscle pronates the forearm, that is turning the hand posteriorly. When the elbow is flexed at a right angle the pronator teres muscle, with the help of pronator quadratus muscle, helps in turning the hand such that the palm faces inferiorly. The pronator teres also functions to flex the forearm and weakly flexes the elbow as well when there is strong resistance. The pronator teres is tested by asking the patient to pronate the forearm from a supine position against resistance with elbow flexed. Pronator teres syndrome is one of three common median nerve entrapment syndromes. It is also commonly known as pronator syndrome as well. Numbness in median nerve distribution with repetitive pronation/supination of the forearm is a common indicator of such injuries.